Sweet, chocolaty, nutty goodness! This basket includes the followings: Milk Chocolate Covered Almonds; Milk Chocolate Covered Cashews; Salted California Almonds; Salted Giant Cashews; Salted California Colossal Pistachios. Sweet Celebration Basket/ Nut Gift Basket - Net Wt. 3lbs 8oz. Giant Cashews (Cashews, Peanut Oil, Salt); Chocolate Covered Almonds (Milk Chocolate (Sugar, Chocolate Liquor, Cocoa Butter, Milk, Anhydrous Butter, Soya Lecithin, Salt, Vanillin, Almonds, Gum Arabic, Corn Syrup and Confectioner's Glaze); Chocolate Covered Cashews (Milk Chocolate (Sugar, Chocolate Liquor, Cocoa Butter, Milk, Anhydrous Butter, Soya Lecithin, Salt, Vanillin, Cashews, Gum Arabic, Corn Syrup and Confectioner's Glaze); Colossal Pistachios (Pistachios, Salt); Jumbo Almonds (Almonds, Peanut Oil and Salt). my friends who received the nut, was very pleased . Great customer service,nice people and products, thank you would highly recommend you to all my friends. Excellent. I look forward to ordering more of these baskets. I only wish it came with a reusable lid. Arrived on time and my family who I sent it to enjoyed the selection. I gifted the Sweet Celebration Basket (3.5 lbs) my boyfriend's father, and he loves them!!! Beautifully packaged. This is my second order with this company and I will continue ordering special treats from here for the important people in my life. Thank you. On time delivery, fresh and well presented. I have been purchasing nuts as christmas gifts for family members for 30+ years. When the company I purchased from for 30 years went out of business last year, I was devastated. I found the Superior Nut Company and hesitantly purchased from them. I was extremely pleased with the variety of nuts and the great customer service. Better yet my husband and other family members loved the nuts. I purchased them again this year and will continue for many years to come. Thanks, Superior Nut Company! Loved the way the chocolate covered nuts complimented the regular ones and the wrapping was stunning! I had the order sent to a relative for Hanukkah. They raved about it so I believe it was perfect. Thank you. 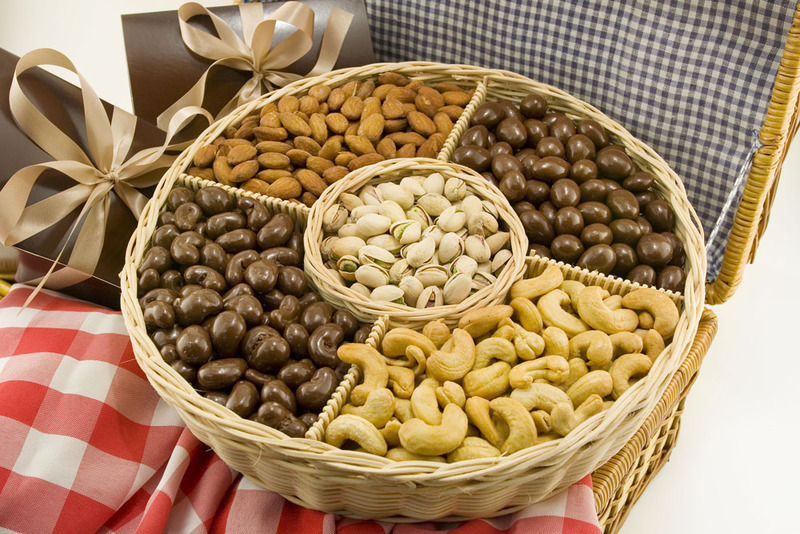 Beautiful basket, nice packaging, excellent selection of nuts. A perfect gift. Taste was very good. Shipped correctly. Also liked that there was not a lot of excess packaging. Will use your company again. Received as a Thank You from one of my husbandâ€™s customers. WOW! How nice and delicious! We canâ€™t keep our paws out of it. We get many Thank You gifts from customers and this is one of the best one weâ€™ve ever gotten. Thank You back to the Vickâ€™s who were smart enough to get this for us! I recently purchased the Sweet Celebration gift basket for my sister. She raved about it. The cashews were very large and fresh as were the other nuts in the assortment. It was well worth the money - finally a gift she enjoyed. I would not hesitate to order again. I sent this basket as a thank you gift and was very pleased by the reception it received. Thank you very much for enabling me to show my thanks in such a classy and affordable manner. Great product--everybody that tries this combo loves it. Have given info about Superior Nut to several friends now,who will e buying I am sure.